It's very important to have a UK phone number when you will be in London. Indeed, if you give a French phone number at an employer, he won't call you back if he do not want to spend more money calling a French telephone. The first choice you will have will be the service. "Do I want a pay as you go service in order to be independent or a pay monthly service in order to know each month how it will cost ?". It is hard to find a plan (pay monthly service) for only three months, and I didn't want to open a plan and to stop it three months later. It's why I choose a pay as you go Sim card for my mobile. If, like every Efrei students, it is difficult for you to live several days without checking your email or surfing on the web, you will be happy to hear that it wasn't so difficult to have internet in London. 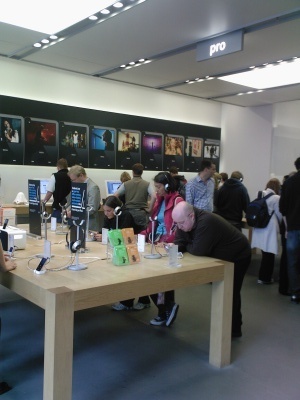 If you are going to live near to Oxford or Regent street, you will be able to use internet in the Apple Center (picture in the right) which open a few years ago. Indeed, there are a lot of demonstration macs connected to internet, and the staff won't blame you. During three month, I worked as a web developer. Thanks to that, I could use the computers at tea break or lunch time. Try to find a job in the IT sector and you will be have a free access to internet. If you need internet only one day per week or if you live near UCL, you can use the UCL cluster rooms. Use services provided by internet cafés. There are a lot of internet cafés in London. Search for one when you know where you will live. If you are rich or if you have a lot of friends who can pay with you, you will be able to open a phone line with BT, and then choose a broadband operator. You have to be careful of one thing: if you open a line and a broadband, you will have to pay for one year even if you stay 3 months.